NORTH ROBINSON — Colonel Crawford’s boys basketball team made it to the district championship game last season, falling to Mansfield St. Peter’s 54-49. The Eagles’ secured their seventh consecutive sectional championship under head coach David Sheldon, who is back for a 13th campaign. Sheldon has an overall record of 198-85 during his tenure, including a 20-5 overall mark a season ago that included a second-place finish in the Northern-10 Athletic Conference, with a record of 14-2. He will be joined on the sideline by assistant coaches Nate Hill, Brett Kaple, Zac Bauer and Adam Daniels as the Eagles look to dethrone the Upper Sandusky Rams as N-10 champions. Upper is gunning aiming for a fourth consecutive title. Crawford is the only other champion on record in the conference, winning the inaugural title back in 2014-2015, a season in which Sheldon claimed Coach of the Year honors. This season, the Eagles return a lot of varsity experience, paired younger talent seeking varsity playing time. Returning lettermen include senior Zye Shipman, juniors Reis Walker, Gavin Feichtner and Jordan Fenner, as well as sophomore Chase Walker. The younger talent includes Mason Studer, the varsity squad’s only freshman, sophomores Seth Carman, Mason McKibben, Drayton Burkhart and Brock Ritzhaupt. Senior Bruce Shull also is looking for more playing time. Gone from last season are Hayden Bute, Harley Shaum and Brody Martin. Shaum posted 12.4 points per game while snagging 8.4 rebounds per contest, which was good for second in the N-10. He earned an all-District VI first-team nod. Martin earned D-IV, District VI honorable mention accolades. Another key loss is Cameron McCreary. The Eagles’ former point guard, a junior, will be suiting up for Upper Sandusky. Last year he averaged 7 assists, 14.8 points and 2.3 assists. Colonel Crawford’s season starts at home Friday, Nov. 30 against Mansfield Christian. Action in the N-10 play begins for the Eagles on Dec. 8 at Upper Sandusky. “It looks to be a loaded top-half of the conference again this season, with Upper, Mohawk and Carey looking very tough,” Sheldon said. File photo Jordan Fenner will be entering his junior year and will be asked to be the primary ball handler for the 2018-2019 edition of the Colonel Crawford Eagles boys basketball team. Fenner averaged 10 points per game and dished out three assists per contest during his sophomore campaign for head coach David Sheldon and the black and yellow. 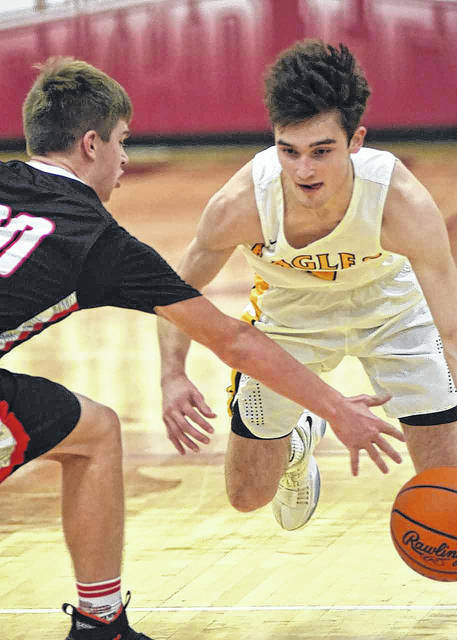 https://www.galioninquirer.com/wp-content/uploads/sites/38/2018/11/web1_Jordan.jpgFile photo Jordan Fenner will be entering his junior year and will be asked to be the primary ball handler for the 2018-2019 edition of the Colonel Crawford Eagles boys basketball team. Fenner averaged 10 points per game and dished out three assists per contest during his sophomore campaign for head coach David Sheldon and the black and yellow.